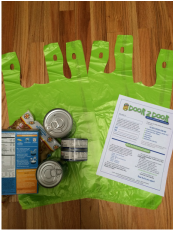 Whether you would like to organize a group or want to contribute as an individual, our DOOR 2 DOOR self-run food drive is a great option. You decide where and when to hold a food drive. We provide instructions, a flyer to copy and use to distribute and even the collection bags if you need them. Community service hours can be earned for this program- just check with us for details. Collect the food and deliver it to the Food Cupboard. We are open on Tuesdays and Fridays between 9:30am and 1:30pm or every 1st and 3rd Saturday of the month from 9:30am-11:30am. Download and print out a photocopy version of this flyer using the pdf link below. You can also click here to request a hard copy of this flyer, get the green collection bags or ask for help with your collection.